The day investors and tech watchers have been waiting for is here: Facebook filed its IPO today, which happens to be its eighth birthday. Its anticipated valuation range is $75 billion to $100 billion, but in the papers submitted with the Securities and Exchange Commission, the wildly popular company states that it hopes its IPO will net $5 billion. Everyone is expecting Facebook’s stock market début to be record-setting. As of this moment, the IPO is expected to occur in May. The rumor had been circulating that some Facebook shares would be made available to small investors, but the filing gives no indication of preparations for such a proceeding, alas. Working at Facebook are 3,200 individuals, and by the Los Angeles Times’ account, roughly one-third of them are on track to becoming newly minted millionaires. 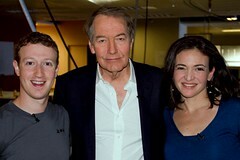 All eyes are on Facebook: in the picture above, Mark Zuckerberg smiles along with famed journalist Charlie Rose and Sheryl Sandberg, Facebook’s COO, who’s already being called a viable future presidential candidate.